UNUS MUNDUS - View topic - Ourobos Dream? I see a crocodile (maybe two?) in a pool tossing about a prey animal, trying to get a grip on it. [I suspect this prey animal is me.] Now I am at the side of the pool, slightly above the water. The crocodile is immediately below me, jaws slightly agape, and appears as if it is smiling, as if it is saying “I’ve got you now!” I put my left hand down onto its snout and close it gaping jaws. I ponder (in the dream itself) that an African friend once told me how to escape the clutches of a large snake. To do so one takes a knife and places it firmly at the jaw/cheek of the animal. By doing so the snake recognises danger to itself and releases the prey. I wonder what the crocodile would have done in this scenario. I wonder if it would have sunk back to the bottom of the pool and heal it’s wounded jaw/cheek by going into a sort of hibernation. You are involved with the water chakra - having a threatening encounter with the reptilian psyche. The whole question in life is “Who eats whom?” Do you assimilate psyche, humanize it and like this become whole or does psyche consume you? The latter is a disaster for then one become inflated, possessed by the archetypal powers. These threatening images remind me of what Jung had to say about “an encounter with the unconscious.” It is touched on in the Book of Revelation in the letters (each letter encouraged the members to persevere to the end) to the seven churches – about the need to be “victorious.” The crocodile appears in ancient Egyptian mythology when the “heart is being weighed in the balance”. If it doesn’t balance the weight of an ostrich feather the soul is fed to a crocodile headed monster. I offer the following amplification on your dream. And so we need to ask ourselves first of all what it means to be “victorious.” We know that John – in so far as he understood the message he was delivering – was referring to the persecution of the early Christians and to the possibility of martyrdom. Thus, to be victorious would mean concretely and literally to be true to the faith even in the face of persecution and even to the point of death. But what did this historical fact of Christian martyrdom mean psychologically? I believe it meant to have survived what Jung calls the “onslaught of instinct” – the onslaught against the ego of any affect of passionate intensity. Archetype of the Apocalypse, Edinger, pp. 27-28. Using your hand to close the crocodiale's smiling jaws is the antidote to being eaten for the activity of human hands produces consciousness - discrimination like the cutting action of a knife. Hands have repeatedly come up in some of your previous material - an eye was seen in the palm of the hands in Eyes In Palms Of Hands. It seems you have found some of the right attitude with which to approach the Eros Self. Like this a Sumo wrestling match (centered on the belly) can safely continue – an image that has repeatedly come up in my material over the years in this inner/outer “dance” with the unconscious. It helps you become whole and like this you "become an inspiration" to others. P.S. The Witch that “LovE’s” you as noted in LovE Has Entered Your House can assume many forms. She is “out to get you” so that you can help consciously carry something of Her Wisdom into our world. This all makes some sense to me. As you know, outer world events (which are, of course, inner also) have assailed me for over a year. I have had an onslaught of passionate intensity (mostly anger) in response. In everyday terms that anger at outer events has been legitimate. I am currently trying to put it all behind me, and doing so for myself and others involved. This means closing my own mouth, saying no more about matters. I have perhaps martyred myself a bit in the entire year-long process. Recently I listened to the following short audiobook, “As a Man Thinketh” by James Allen. The suggestion is that one attracts one’s own outer circumstances. I highly recommend a listen. I am currently trying to look at myself and outer events in this light. But is the heart as light as an ostrich feather? Can’t immediately say so. Must have more work to do. This morning while meditating I saw the following outer/inner image for the "fatboy" Sumo wrestler. Like this the World Soul likes to make a further amplification on the antidote to the threatening reptilian psyche and how to "save the world". It reminded me of Christopher's bomb mirroring image using the Fatboy atomic bomb that destroyed Hiroshima. This was an amplification on the dream I had shared with Remo about constructing an "anti-bomb" - see the dream Remo comments on in Atomic Bomb Is Protecting Against An Alien Invasion - May 2006. It's a way of "praying that God doesn't do it" as MLvF hoped for. This kind of "victorious" wrestling is connected to Avatar making and Fox's "blue Christ" discussion as shared in Avatar Blue? - 27 Sept. 2012. Jung on his death bed had a vision. He left a drawing with a line going up and down. The last fifty years of humanity (GJS: that would take us to 2011). A time of catastrophe. Since I have those notes in the drawer I don't allow myself to be too optimistic. When I think of all the beauty of life and the billions and billions of years that it took to appear and that man would go out of sheer shallow foolishness and destroy it all and that life might go from the planet. And we don't know if there is any other (intelligent) life experiment in the galaxies. And we go and destroy it. I think it’s so abominable. I pray that it may not happen - that a miracle happens. Young people seem today to be giving up and running away into a fantasy world. Give up and leave this earth. I think one shouldn't give up. I think of the answer to Job, because if man would wrestle with God – if man would tell God that he shouldn't do it - if we would reflect more. That's why reflection comes in. Jung never felt that we might do better than just possibly sneak around the corner, with not too big a catastrophe. When I saw him last he had also a vision. "I see enormous stretches of the earth (destroyed) but thank God it’s not the whole planet. Dr. Marie-Louise von Franz, Matter of Heart (film). I am afraid the anti-bomb thread is all a bit beyond me. Dream that followed Crocodile dream: A group of campers are setting up tents. They have intention to discuss schizophrenia. I am uninterested in this group discussion. Now I am drawn away a distance by a man who points to a plot as if I should set up tent here. But in fact I realise he is pointing to a bunker beneath the grassy earth. Now I am in this bunker. I see a shower cubicle next to a bath. I think this bunker is badly built as I realise that it will flood or become damp for not having had a waterproof base installed before it was built. I especially think this will happen around the shower base. I can associate this dream to recently driving a pile into earth as a temporary floorboard support. I also vaguely associate to your double sumo fatboy in the sense of Campers above ground and Campers/bomb-blast survivors below ground. Interestingly, I wondered (laughingly) if I saw a UFO today. It looked like a black ball, with occasional metallic glints floating across sky. A fixed wing plane followed and passed it, then it disappeared behind a wispy cloud. The plane returned some five minutes later. I wondered if the pilot returned for another look. Recently, by the way, I asked myself what I would have done if I had been Roosevelt. I am not sure if any of this relates to my original post or your own, but if you can make anything out of it, please do. Fair enough. I would however, suggest that you focus on Roger’s comments near the start of that thread – the ones that immediately followed Remo’s posting of my dream for he touches on several aspects of a certain right attitude with which to approach the Eros Self – aka “my first true love.” Like this you can see some connections to your latest dream. I will try to elaborate using the following amplifications. A group of campers are setting up tents. They have intention to discuss schizophrenia. I am uninterested in this group discussion. Now I am drawn away a distance by a man who points to a plot as if I should set up tent here. But in fact I realize he is pointing to a bunker beneath the grassy earth. Now I am in this bunker. I see a shower cubicle next to a bath. I think this bunker is badly built as I realize that it will flood or become damp for not having had a waterproof base installed before it was built. I especially think this will happen around the shower base. Tents for me are something people use when seeking a “wilderness experience” with Nature – something I have found to be connected to the Exodus experience (of leaving a collective worldview that enslaves, restricts) and like this to wandering in the wilderness for 40 years until a new worldview is realized that aligns with the worldview of the Eros Self. Schizophrenia is a persistent psychosis - often clinically diagnosed for people who have had a powerful spiritual awakening experience like the author of the recent book Dispelling Wetiko: Breaking the Curse of Evil. The healthy version of this experience is a conscious realization that has a willingness to enter an altered state. I have a copy of DSM-III – the Diagnostic & Statistical Manual of Mental Disorders from which I have read about the clinical features of Schizotypal Personality Disorder which includes many features one will normally experience when in an Eros ego state of consciousness for the World Soul will require this kind of psychic functioning in order to be able to communicate with Her, i.e., be open to Her bazaar worldview and how She likes to psychically connect. In the following list numbers 1, 2, 3, 4, 5 & 6 I have found relevant for myself when living this Eros ego state intensely like I do in my retirement years. Living out of this state is how "Hell's Anti-Bomb Enlightenment" takes hold. I should also note that in my earlier years #7 & 8 were active. This seems to reflect that another "inner" point of view was critical of my outer worldview. The following are characteristic of the individual’s current and long-term functioning, are not limited to episodes of illness, and cause either significant impairment in social or occupational functioning or subjective distress. At least four of the following are required to render a diagnosis of Schizotypal Personality Disorder. (1)	Magical thinking, e.g., superstitiousness, clairvoyance, telepathy, “6th sense,” “others can feel my feelings”, bizarre fantasies or preoccupations. (3)	Social isolation, e.g., no close friends or confidants, social contacts limited to essential everyday tasks. (4)	Recurrent illusions, sensing the presence of a force or person not actually present (e.g., “I felt as if my dead mother were in the room with me”), depersonalization, or derealization not associated with panic attacks. (5)	Odd speech, e.g., speech that is digressive, vague, over elaborate, circumstantial, metaphorical. (6)	Inadequate rapport in face-to-face interaction due to constricted or inappropriate affect, e.g., aloof, cold. (7)	Suspiciousness or paranoid ideation. (8)	Undue social anxiety or hypersensitivity to real or imagined criticism. The underground “doomsday” bunker so sought after in our time by certain people smacks of a need for #3 - “Social isolation” – on the outer level and as deep introversion on the inner level. In your dream it is damp, moist – places where the chthonic aspect likes to live like snakes and reptiles. It is “in the earth”, i.e., embedded in the feminine principle which is pure Nature. The shower, bath aspects will help you wash the dirt of the old worldview away and that involves entering the water chakra where you observe Her images, hear voices, have body sensations, experience spontaneous perceptions and associations, etc. On and on like this. Last edited by Gregory Sova on Mon Jul 01, 2013 8:42 pm, edited 1 time in total. I have re-read Roger’s thoughts. Together with your latest observations on the bunker, they all start to sink in. Will ponder, add more later if I can. I saw a UFO today. It looked like a black ball, with occasional metallic glints floating across sky. A fixed wing plane followed and passed it, then it disappeared behind a wispy cloud. The plane returned some five minutes later. I wondered if the pilot returned for another look. Jung and the ethnobotanist Terence McKenna hypothesized that the ET/ UFO phenomenon might actually be an expression of the psychic fact that we have become so split off from our true self that we can only begin to experience it in the projected form of an “alien other.” Paul Levy, Dispelling Wetiko: Breaking the Curse of Evil, (Kindle Locations 2143-2145). North Atlantic Books. Kindle Edition. A sphere, like a circle, is a symbol for wholeness - and thus the quest for individuation - a connection to the she bear rolling the white sphere in the stone carving of Carl Jung. That it was black suggests it is yin consciousness (Eros Self) not yang consciousness (Logos Self) that needs to be integrated so that they interact in a complementary way. It is the Eros Self clamoring for integration via a state of the Eros ego which necessarily mimics schizophrenic symptoms – such as seeing a UFO when in fact it may have merely been a hallucination. The good news is that you haven’t been abducted. I guess because you try to approach the Eros Self consciously so that you can wrestle with Her by taking the time to meditate - be introverted like a monastic. Like this an external event mirrors an internal psychic state. A fixed wing airplane can appear as a crucifix † in the sky depending on cloud cover and viewing angle. In Chinese philosophy, the concept of yin-yang is used to describe how seemingly opposite or contrary forces are interconnected and interdependent in the natural world; and, how they give rise to each other as they interrelate to one another. Many natural dualities (such as male and female, light and dark, high and low, hot and cold, water and fire, life and death, and so on) are thought of as physical manifestations of the yin-yang concept. In my visions I have seen many black spheres over the years – these "Civil War" cannon balls (aka fish eggs) were being “bowled” into spacetime by the APOCALYPTIC (alchemical) Christ through a long tunnel (tube) from out of the Beyond. Their enormous number suggests a collective individuation destiny looms for humanity. This activity was followed by a voice which said, “They will have a devastating effect.” They will be destructive if not greeted with consciousness and always devastating to one's existing worldview. It's a connection to "Make a difference or hit delete." As a further amplification I mention the following black spheres which Jung noted in his book Flying Saucers which was also published in his Collected Works, Volume 10 Civilization In Transition. The challenge of integrating the Eros Self has been rumbling around for quite a while given the dates of the following occurances. Alchemy has anticipated this coming global event much longer. As the illustration shows, this sighting was made in Basel. The dark color of the UFOs may be due to their having been seen against the light of the rising sun. Some of them were bright and fiery. Their speed and irregular motion are typical UFO features. CW 10, Flying Saucers §§ 758-759. This broadsheet relates the story of a “very frightful spectacle” seen by “numerous men and women” at sunrise on April 14, 1561. They saw “globes” of a blood-red, bluish, or black color, or “plates” in large numbers near the sun, “some three in a row, now and then four in a square, also some standing alone. And amongst these globes some blood-colored crosses were seen.” Moreover there were “two great tubes” – three in the picture –“ in which three, four and more globes were to be seen. They all began to fight one another.” This went on for about an hour. Then “they all fell – as one sees in the picture – from the sun and sky down to the earth, as if everything were on fire, then it slowly faded away on the earth, producing a lot of steam.” Underneath the globes was a long object, “shaped like a great black spear.” Naturally this “spectacle” was interpreted as a divine warning. This report, as the reader will have noted, contains certain details already known to us. Above all the “tubes,” which are analogous to the cylindrical objects in the UFO reports. These, in UFO language, are the “mother-ships” which are said to carry the smaller, lens-shaped UFOs for long distances. The picture shows them in operation, releasing UFOs or taking them on board. Especially important, though lacking in the modern UFO reports, are the indubitable quaternities, seen sometimes as simple crosses, sometimes as disks in the form of a cross, that is , as regular mandalas. There also seems to be a hint of the 3+1 motif in the dilemma of three and four. The militaristic interpretation is as characteristic of the sixteenth century as the technological one is of ours. The tubes are cannons and the globes cannonballs, and the shooting to and fro of the globes is an artillery engagement [GJS on 3 July 2013: a possible Civil War connection – something that has become common in our time as seen in Libya, Egypt and Syria]. The great black spearhead, as well as the spearshafts (? ), seem to represent the masculine element, especially in its “penetrating” capacity [GJS on 3 July 2013: given the crucifixes in the image this spearhead could also be a connection to the “Spear of Longinus” that penetrates the heart of the crucified]. Similar things are reported in the UFO literature. Columns of smoke rise up from the place where the cannon-balls have fallen, reminding us of Tanguy’s picture. The moment of sunrise, the Aurora Consurgens (Aquinas, Boehme), suggests the revelation of the light. Both reports have clear analogies not only with one another but also with the modern saucer stories and with the individual products of the unconscious today. CW 10, Flying Saucers §§ 760-763. P.S. 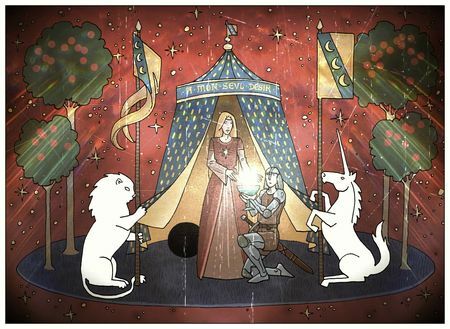 The yin aspect is seen from a different angle in the recent post Completing The King Arthur Legend which was sparked by the Excalibur dream of Fox. In the aftermath of having submitted The Black Spherical UFO I saw a couple of old visions return when I took time to meditate once again. They serve as a further amplification on the meaning of the black (tar baby) UFO and occurred about a year after the black sphere images with the apocalyptic Christ shared in the above post. Like this it seems I am being encouraged to share these further details with the forum. But first, I will need to share a little background on how a “paranormal” event occurred before these images came into view on 11 April 2009. We retired to Weed, CA on 11 Sept. 2004 (exactly 3 years after 9/11) – to a home we purchased on Lake Shastina. On 26 October 2004, a day before a lunar eclipse that was visible in our area, a Rev. Ariana Solana (Reiki Master) of Dunsmuir, CA took the following unedited picture with a digital camera of Milkhouse Island on Lake Shastina from a street called RAINBOW Drive – while looking towards the west in the view. I was not aware of this event. Then as if in a meaningful conincidence Kristin (of our unus mundus forum) emailed me on 7 Sept. 2007 that she was spontaneously given an unsual postcard picture that her mother had purchased in Vancouver, Canada and since it was connected to where I was living she thought I should see it. The photographer says she did not “see” the “artifact” when she took the picture – see Blue Ray Guardian - Video for her amplifications on this image. Further, visit InterdimensionalLight.com to view higher quality images. "BLUE RAY GUARDIAN" - the Blue Ray Guardian incorporates the Spirit of Peace. This unedited picture was taken with a digital camera at Lake Shastina, California. It is activational, carrying codes for new energies coming into Earth, and will assist your (GJS: subtle) body to accommodate these new energies"
Then on 11 April 2009 I saw the following images while meditating - the black sphere being replaced by the Madonna figure. I labeled the latter image “Co-Eternal” because “God needs man to complete the work of redemption” (C.G. Jung). Like this man is elevated to co-creator and like this humanity has a role, because its existence has been afforded great meaning by the divine – observing the inner movie is meant. The white teardrop shape is "a tongue of fire" something that decended on the Apostles in the upper room on Pentecost. Like this the image suggest that the mana of Her knowing wants to enter you. The ascending flame is white, but right below as its very throne is a blue-black light whose nature is destructive. The blue-black flame draws stuff to it and consumes it as the whiteness flames steadily on. The destructive blue and the white belong in the same fire. As Scholem comments, by virtue of its very inhesion in the nigredo, the blue flame is able to consume the darkness it feeds upon.